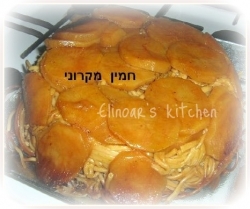 Traditional Sephardic dish served during the weekend after being cooked all night in the oven. Total Time: 5 hour(s) 20 min. Fry chopped onion in oil for couple of minutes, add spices and chicken drumsticks. Fry chicken for a few minutes on all sides. Remove from gas stove. Switch on oven to 100 degrees C. (212F). Cut potatoes in thick slices and insert in to the bottom and sides of a good oven proof pot. Add half amount of macaroni over potato with the remaining oil and chicken drums. Add eggs and put them between chicken drums. Cover with the remaining macaroni. Over it pour the macaroni cooking water, cover with greaseproof paper and aluminum foil. Cover with lid pot or aluminum foil, bake from 4 hrs - all night. Before serving , turn pot over a large serving plate.